This dreamcatcher is available in a 9" (22.86cm), 12" (30.48cm), or 15" (38.1cm) diameter and the overall length is about 24" (60.96cm), 30" (76.2cm), or 36" (.9144 metres), depending on the hoop size, and not counting the hanger strap. The lengths given might vary by a couple inches. It has 8 leather streamers decorated with glass crow beads and colorful duotone feathers, as shown, or choose your own feathers from the dropdown menu below. It also has two long streamers of peacock feathers, and two beaded strands, with a large amethyst crystal at the end of one of them. If you want, you can also add other trinkets from the dropdown menu below. This dreamcatcher also has amethyst stones in the web, or choose a different stone from the dropdown menus. You can also choose the leather color you prefer. 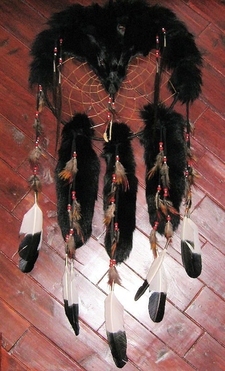 Pretty much every aspect of this dreamcatcher is customizable so you can get the exact combination you want. Shown in this picture with a 12" black leather hoop, with turquoise and purple feathers and amethyst stone beads in the web. This product was added to our catalog on 11/18/2013.